Buddha Weekly is a Buddhist magazine focused on Vajrayana, Mahayana and Hinayana. Our mission is making Buddhism in all its wonderful forms accessible. Buddha Weekly Online Magazine, published since 2007, takes a topical approach to modern Buddhist feature writing. Topics of interest to modern Buddhists, from the multiple points-of-view of many teachers. Buddha Weekly: Buddhist Practices, Mindfulness, Meditation. Copyright Buddha Weekly. Modern life affords us so little time to practice accumulating of merit and purification—and so many excuses to postpone for today. Who has time for daily offerings? It’s all most of us can do to fit in ten minutes of meditation. Isn’t it better to attend the next Vajrasattva Retreat or Empowerment than to take ten minutes a day for offerings? Even the great Lama Tsongkhapa, an enlightened being, practiced daily, focusing especially on purification and increasing of merit. Manjushri, at one point, advised the famous enlightened scholar to put aside scholarly pursuits and focus on purification and offering of the mandala. It was as a result of this, we are taught, that Tsongkhapa gained the higher realizations that he is known for in sutra in the tantra. 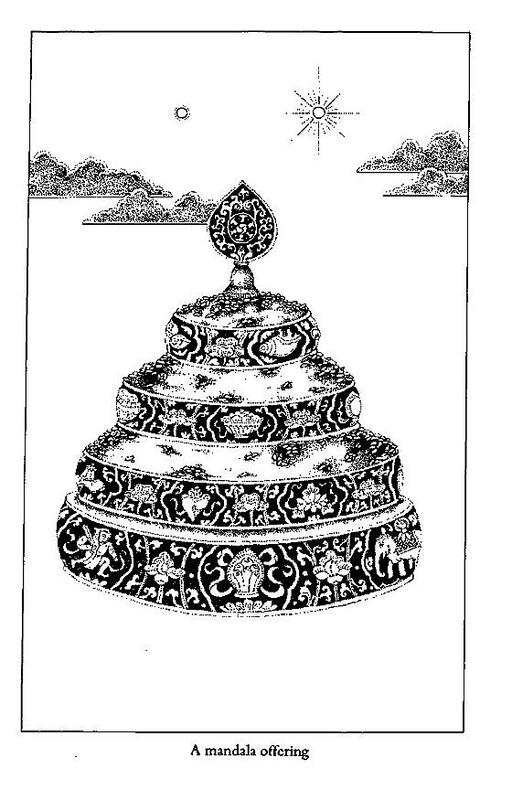 Lama Tsongkhapa did over one million mandala offerings, but because Lama Tsongkhapa was very poor, he used a stone base and stones. He did it until the skin tore off. Lama Tsongkhapa completed 1 million mandala offerings. Accumulation of merit and purification are two foundation practices of any Vajrayana Buddhist. We accumulate merit many ways—following the precepts prime among them—but extraordinary merit is accumulated through practice of Mandala offerings. In doing a mandala offering, we offer the entire world, everything, not just our earth, but every one of the billions and trillions of planets throughout all universes. We visualize we are purifying incorrect motivations and receiving great blessings from the merit field. We offer the mandala from our hearts, to open our minds. A completed mandala is an act of offering and meditation, helpful in reducing bad karma and increasing merit. 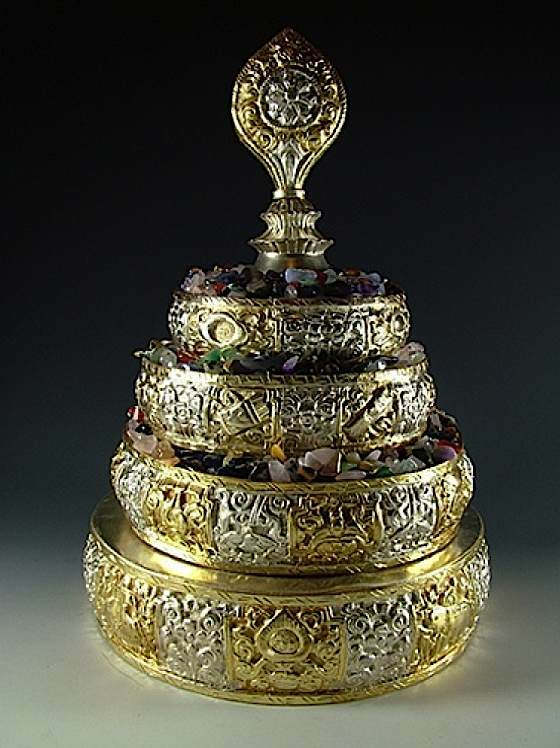 Each level is filled with offerings until the tiered mandala is filled with semi-precious stones, rice, grains, coins or any precious offering. The ‘universe’ of the completed mandala is then offered over the head to show you would give the entirety of existence to help others attain enlightenment. The base of a Mandala set represents the golden ground of the world or universe. The first ring placed on the base represents the iron fence and the continents. The next rings represent Mount Meru. The Mandala top symbolizes all the precious things in all the universes, our own precious virtues. Mandala offerings are considered one of the most important daily practices because the act accumulates different types of merit, but ordinary and primordial wisdom merit. We practice generosity, which overcomes the stingy or greedy mind full of desires and attachments. We then give up these attachments to the material by offering them to all beings in the universe. We visualize we are offering up the wealth of the entire universe to the Buddhas, the Bodhisattvas, the Dharma and the Sangha. Every day, this reminds us of the importance of good conduct, generosity and merit activities. Mandala gives us the motivation to achieve our goal of Buddhahood. It is both a purification and an offering. In making the daily offering to all beings, to the prosperity of all beings and the entire universe, we accumulate great merit. To advance in our own spiritual lives, we need only lightly shadow the example of Lama Tsongkhapa, being diligent in our daily and weekly practice. Prostrations, mantra, meditation and mandala offerings all accumulate merit and purify negative karma. An annual retreat, while of great value, is not as potent as a simple, short, daily practice. We are taught there are three types of mandala offerings, which fall into the broad descriptions of external, internal and secret. External is practiced by all Buddhists, a whole-hearted and generous offering based on sutra and suitable for everyone. Internal and secret are both unique to advance tantric practice. Mandala is symbolic in all three types of offering. Meditating on the concept of Mandala is a worthwhile activity. Mandala itself, is a form of meditation, that illustrates for us the illusory nature of reality. Merit is accumulated by the act of offering benefits to the entire universe. Unlike other offerings, we offer the same mandala offerings over again each time. We begin by purifying our incorrect motivations by wiping grain over the base of the mandala. We then draw blessings towards ourselves. Each day we offer the same semi-precious gems, grains and other materials, renewed and pure each time they are offered. This becomes a precious new offering. Important in renewing the offering is intention: the intention to make offerings, to purify negative karma, to offer merits to all beings suffering in the universe. Visualize the mandala as everything precious in the Universe—the most perfect riches of the worlds of gods, humans and the universe. You offer these precious things up to the Buddhas and Bodhisattvas. The mandala is a microcosmic illustration of the Buddhist cosmology. It need not be taken literally, and, in fact, helps us remember the nature of ultimate reality. It is not a physical representation of reality. Yet the symbolism is rich and worthy of hours of focused meditation. Using modern visualizations is not as valuable as trying to visualize the traditional cosmology. At it’s centre is Mount Meru, not a literal mountain, but the centre of the entire universe. Surrounding Mount Meru are seven golden mountain chains. There are four levels of ground, four below the oceans and four above. Above all, is the sun and moon. The highest level in the mandala is the domain of the gods in the desire realm. There are four great continents and eight subcontinents on the great ocean surrounding Mount Meru. A great iron fence surounds the ocean, which rests on golden ground. Take your mandala set on your lap. Hold the mandala base in your right hand. If you have arthritis or can’t hold the base, place on a table. NOTE: Do not speak the (brackets out loud — these identify where to pour the grain on the mandala). Italics are actions, not spoken. Take some grain in your left hand and hold the mandala base. Take grain with your right hand and put it on the base. Wipe clockwise three times with your forearm, tipping the grain away from you. Visualize that you are purifying incorrect motivation. Take grain and put it on the base again. Wipe anti-clockwise three times with your forearm, tipping the grain toward yourself. Visualize that you are receiving great blessings from the merit field to open your mind to offer the mandala from your heart. Spread some grain over the base to symbolize the golden ground with precious jewels. 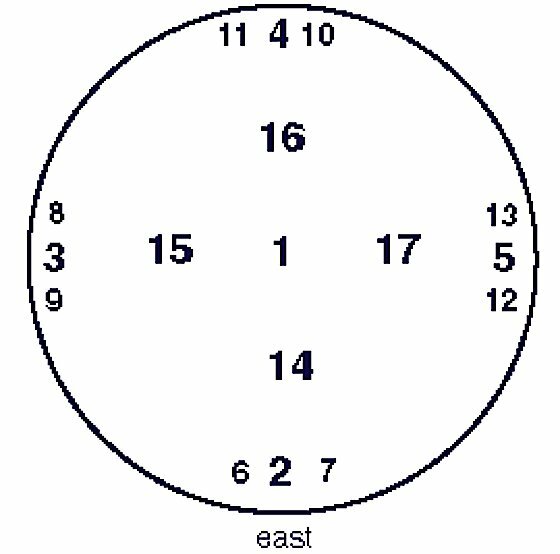 Illustrated are numbered areas on the different levels of the Mandala, corresponding to the spoken meditation and offering in this article. Place the first ring on the base. Take more grain and sprinkle it around the inside of the ring. This symbolizes blessing the iron fence that encircles the universe. East is toward you if the aim is receiving blessing power from the merit field. East is away from you if your aim is accumulating merit. Place the second ring on top of the grain-filled first ring. Visualize placing the eight precious objects belonging to a wheel-turning king who rules the four continents. The first ring of the mandala. 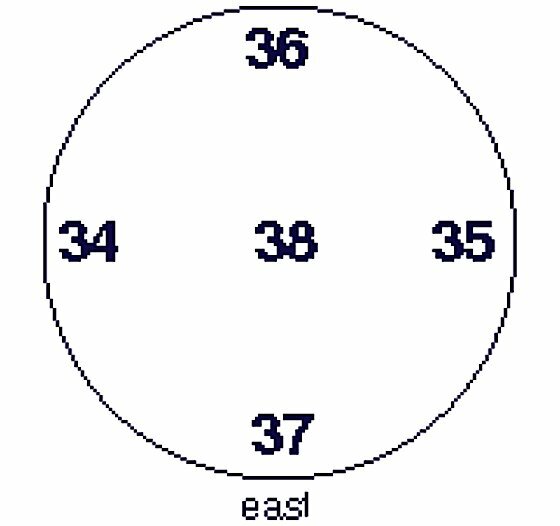 After placing the first ring on the base, offerings are made as instructed to these numbered locations. 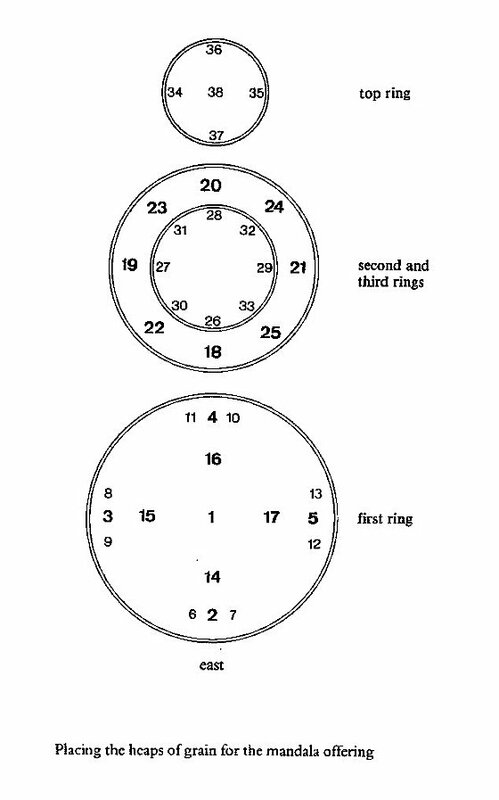 Place the third ring on the grain-filled second ring. Place the grains to your left and right for the sun and moon. Place the banner of victory toward you to receive blessing power from the Buddhas and Bodhisattvas. If there is an obstacle, place the parasol toward you to symbolize receiving protecting power from the Buddhas and Bodhisattvas. 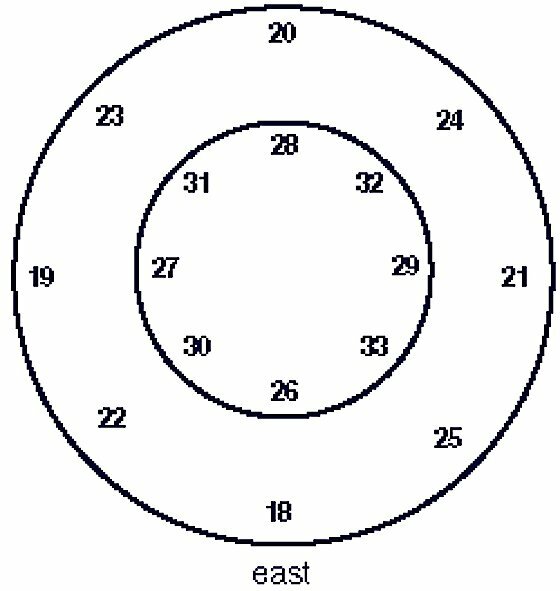 The second ring of the mandala with numbered positions per the instructions. Place 38 the mandala top in the middle to symbolize the offerings of Samantabhadra. In the center are the most perfect riches of gods and humans, with nothing missing, pure and delightful. To my glorious, holy and most kind root guru, the lineage gurus and in particular to the great Lama Tzong Khapa, Buddha who is the king of sages, Vajradhara, and the entire assembly of deities, I offer these as a Buddha-field. Please accept them with compassion, for the sake of migrating beings. Having accepted them, please bestow on me and on mother sentient beings abiding as far as the limits of space your inspiration with loving compassion. • Visualize an enormous tree on the top of Mount Meru with many branches spreading throughout space. On each branch is Bodhisattva Samantabhadra, creating from his concentration innumerable priceless offerings to the Buddhas and Bodhisattvas. Transform the universe you have just created into a pure universe. Third ring of the mandala. • Having made your request, tip the grain toward you, thinking that you are receiving their blessings. Visualize that from their hearts emanate brilliant white light and nectar which enter through your crown chakra, completely filling your body and mind and purifying all obstacles formed by negative karmas and delusions that hinder us from gaining realizations. • Perform your meditation practice then dissolve the merit field. 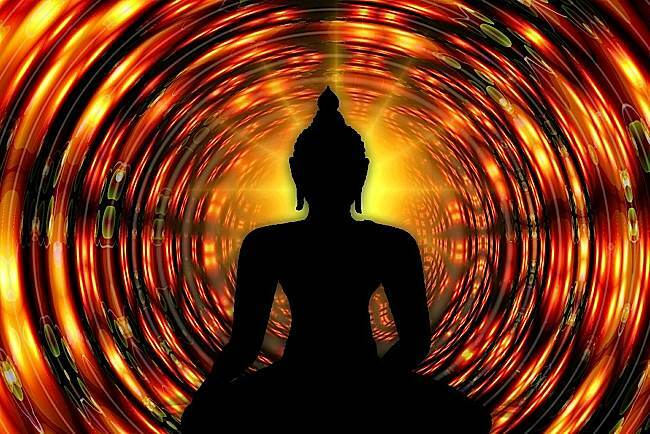 At your heart is an open lotus, Guru Shakyamuni descends through your crown chakra and sits inside the lotus. Think that he becomes inseparable from your mind. It is important to face the Mandala towards you, with a cloth in your lap, and tip it into your lap so that all the offerings and rings fall towards you (caught in a cloth on your lap. You can then store the mandala by placing the rings inside the hollow of the base, and the grains or gems inside the rings, wrapped in your cloth. The post Purify Karma and Accumulate Merit with Mandala appeared first on Buddha Weekly: Buddhist Practices, Mindfulness, Meditation. Mahamudra meditation is awareness and understanding of the true nature of mind; it is spacious, without beginning or end. It is like observing the sky without the trace of birds, or the criss-cross of jet planes. You can merge your consciousness in the state of Mahamudra, beyond words and thoughts. The true nature of the mind is raw or naked awareness. It is an uncovered, untamed and unaltered state, without fabrication. Here, Rinpoche introduces us to the spacious mind through Samatha. In the weekend retreat, he covers both Mahamudra according to Sutra and Tantric Mahamudra. “Mind is emptiness and emptiness is also mind. There is no mind other than emptiness, no emptiness other than the mind”. “Mind does not exist within the mind, but the true nature of the mind is clear light”. After detailed instructions, he invites us to meditate. The teachings are continued in Session 2. Teachings were at the end of 2018 at Gaden Choling in Toronto. 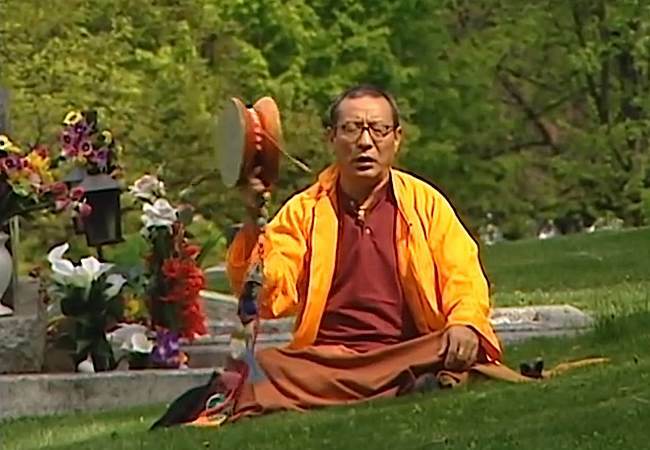 Venerable Zasep Rinpoche is the spiritual director of several meditations centres in Canada, Australia and the USA, and teaches around the world. In the Mahamudra weekend retreat — which will be presented in a series of videos — Rinpoche teaches both Mahamudra according to Sutra, and Tantric Mahamudra. 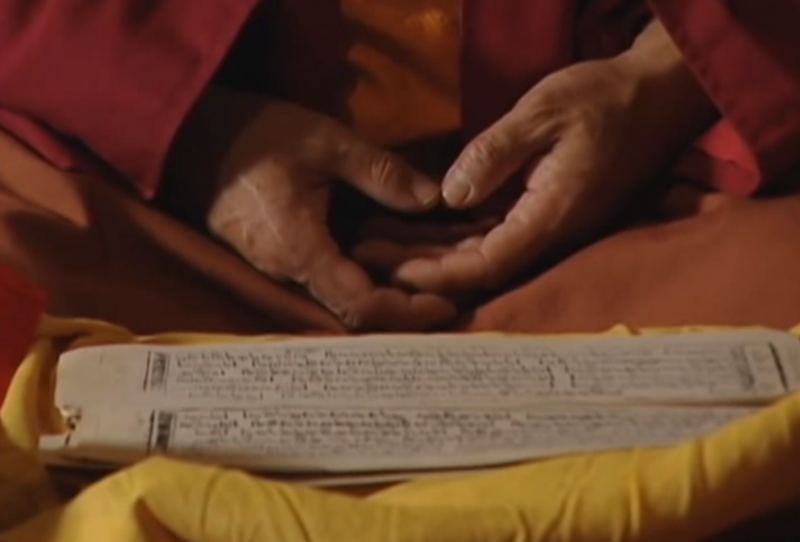 In this video, he begins with instructions in Samatha. In future sessions he teaches Vipashana, and finally Tantric Mahamudra methods. Gelug Mahamudra, Eloquent Speech of Manjushri by H.E. Zasep Tulku Rinpoche, illustrated by Ben Christian. Video teaching on Samatha and resting the mind in the natural state at a weekend retreat on Mahamudra with H.E. Zasep Rinpoche. The post Samatha meditation teaching: “Resting the mind in the natural state,” video of session 1 of a Mahamudra weekend retreat appeared first on Buddha Weekly: Buddhist Practices, Mindfulness, Meditation. As you might expect of 185 devoted Buddhist nuns, they ask for very little, but here in Zanskar Valley — one of the most isolated valleys in the Himalayas — many live without heat, water and electricity. Some of the nuns are children, as young as four years old, sent there by low-income families unable to raise their daughters, and the oldest nun is 88. They are not quite “forgotten”, but they cope with being cut off from the rest of India; a single lane road, open only 7 months a year, connects this frigid valley — at 3500 meters above sea level — with the rest of India. An elderly nun makes her way by foot through the humble buildings of one of Zanskar’s nunneries. A rugged vehicle is needed to traverse the so-called road. For all of these reasons — and the severe poverty in the region — the nuns of Zanskar are “almost forgotten. Here, money is scarce, but it pays for a lot. 20 dollars feeds a nun for one entire month. $5 gives the nuns transportation to the local health clinic. A hundred dollars can put a nun in clothing, shoes and hygiene products for an entire year. Those dollars are hard to come by in the remote, nearly forgotten region. Imagine living with limited heat, in a perpetually cold climate, with only a few hours of electricity per day. In some areas, the nuns must melt ice for water. Some of the nunneries have no communal kitchen. Many of the nuns of Zanskar are children who may have limited access to education and healthcare. Unlike other areas, where the locals help the nuns with ample donations of food and clothing, Zanskar valley is impoverished — and typically the monks receive the better donations. Their best hope of aid comes from Gaden Relief, a tiny certified charity in Toronto, Canada, who have made it their mission to help the Zanskar nuns. The nunneries in Manda, Rizhing and Byra are the worst off in the valley, with a critical shortage of everything, even heat and food, and basic healthcare. Shoes and clothing must last years, not months. For housing, they built simple structures themselves. Only one of the nine nunneries has access to formal education for the child nuns. Many of the buildings were built by the nuns themselves and pair. There is only one single-lane road into the valley, accessible only a few months per year. Unfortunately, the reality of the area is frigid cold, lack of food, poverty, and gender inequality — women are not empowered or equal in the region. Nuns simply are the last to receive donations. Young nun Stanzin is in recovery and good spirits after neurosurgery. The surgery was only possible after an urgent appeal at a weekend retreat in Toronto. The attendees at the retreat donated money to help pay for her surgery. She had to be flown to the hospital. Irina Safonova, from Gaden Relief took a special interest in the isolated and humble nuns of Zanskar. She visited at her own expense, assessed what was need, and has now organized a GoFundMe relief drive. Ninety-five percent of donations directly benefit the nuns, since the charity is run entirely by unpaid volunteers. Irina from Gaden Relief visited the nuns a few months ago. Many of the nuns are children. This time, instead of emergency surgery, the funds will be allocated to the simpler things we take for granted in the west: food, water, heat, and electricity, and healthcare. Some fo the needs are infrastructure since they have little in the way of water and electricity. A few of the nunneries have solar power for a few hours a day, thanks to some past donations. Some of the nuns are quite elderly, the oldest 88. School: Karsha Nunnery desperately needs a school, which will cost about $12,000. Karsha nunnery is in a very remote area, cut off from road access for much of the year. Gaden Relief is a small volunteer-only certified charity that has supported nuns and monks in many poor areas. Gaden Relief has been helping the nuns of Zanskar since 1991, with 95% of donations reaching the nuns. The post The forgotten nuns of Zanskar: 9 Buddhist nunneries in “one of the coldest inhabited places” have limited electricity, water and healthcare appeared first on Buddha Weekly: Buddhist Practices, Mindfulness, Meditation. On the other hand, Tara appears as the Divine Mother, the Female Buddha who can save sentient beings — who cares for us ferociously as our own mother would — the Saviour Buddha. Both are “action-oriented”: Green Tara with her one leg extended, ready to leap to the aid of her followers, and Vajrayogini who dances in the bliss of Shunyata, to show us the way to Enlightenment. Vajrayogini and Green Tara can be thought of as two aspects of the Wisdom Female Buddha. Tara is a lower tantric practice, generally, although Chittimani Tara is a Highest Yoga practice. Lower Tantra does not imply it is less important than Higher Tantra. 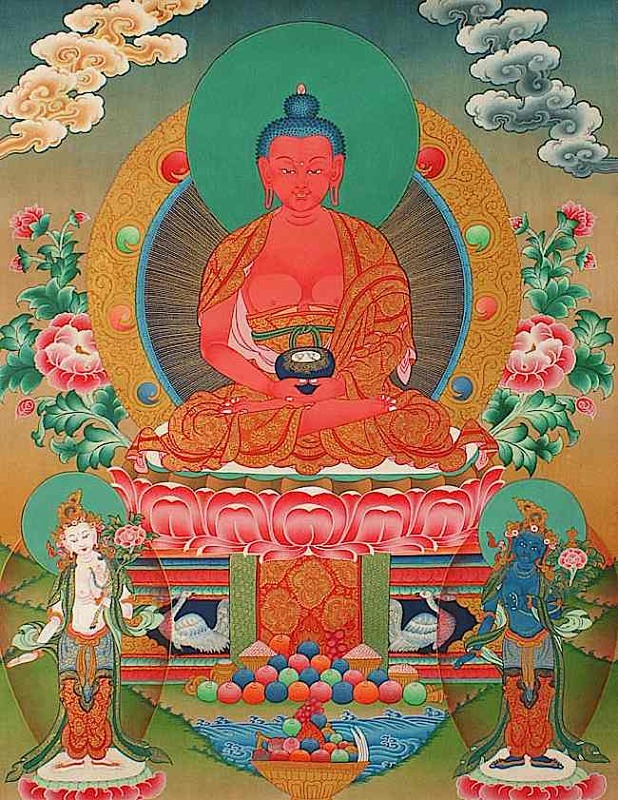 Tara is a beloved Female Buddha, the active protector. “Tara is more for helping develop common siddhis [someone who has attained enlightenment or a paranormal power possessed by a siddhi], for instance, to prevent disasters and to protect you from evil on the path. If you use it for your own personal benefit, that is not the right way. It is for achieving the ultimate goal and helping all beings. You need a long life and wealth and health for that. If you are involved in Tara’s blessings for that reason, that is the right idea, but it is not just for the worldly benefits. It’s like asking a great emperor to sweep the house. It is the Female Buddha’s role as “wisdom personified” that not only makes Her practice important but also leads to the vast diversity of symbolism between Her many aspects. Divine Mother or Blissful Wisdom? While most Vajrayana Buddhists categorize the different aspects of Buddha as one of four classes of Tantra — described this way, in part, this way to emphasize the practice emphasis — scholars tend to categorize Tara as a Mahayana practice and Vajrayogini as a Tantric practice. Serene and motherly; or ferociously compassionate? His Holiness the Sakya Trizin, describes them with similar language: “Actually, Vajrayogini has many different forms, but the one we normally use is in between wrathful and peaceful. She is usually in the red color, with one face and two hands holding a curved knife and skull cup filled with nectar and she is adorned with bone ornaments. All these different ornaments and objects have many very deep meanings. The curved knife usually represents the fact that she cuts all defilements. The cup represents what in Sanskrit is called mahasukha, which means “the great bliss.” She is in a complete state of great bliss all the time. The 21 forms of Tara include White Tara and Green Tara, among the most beloved deities in Tibetan Buddhism. While Tara is famous for her many practice and meditational forms — 21 Taras, 108 Taras, White Tara, Green Tara, and her Highest Yogic aspect Chittamani Tara — Vajrayogini is equally diverse, but in a strikingly different way. She can be the consort (representing Wisdom) of many Buddhas: Chakrasamvara, Hayagriva, and many others. Tara can be found in all of the four classes of Tantra yogas, while Vajrayogini is only found in the Highest Yogic practices. Tara is famously associated with praises and supplications for aid in our daily lives and practices; Vajrayogini is, on the other hand, most notably associated with supreme practices such as the Six Yogas of Naropa, the Eleven Yogas of Vajrayogini, and, of course Tummo — all advanced practices. Both Tara and Vajrayogini are also known for their mantras. Tara’s mantra, Om Tare Tuttare Ture Svaha, is chanted by millions around the world, and is well known for its effectiveness. A practice of Tara can be simply that — her mantra. Likewise, Vajrayogini is well known for the practice of her mantra — which is not published here, as it’s best to have initiation and instruction into her practice first. Vajrayogini’s practice is also considered a powerful, complete practice. This is somewhat unique amongst Highest Yoga Tantra deities. Chanting Vajrayogini’s mantra can lead to Enlightenment if chanted by a person of complete faith. In other words, their mantras, just like their aspects, have different aspects and emphasis, but they are the same at the core. Tara, as a Buddha found in all four classes of tantra, is diverse, and can help us in many ways. Vajrayogini tends to be more focused almost on Enlightenment. Her dance transcends mundane concerns. But, she is still a mother, who loves her children, and there are countless stories of her saving and helping her followers. Her approach may be more dynamic and fierce, but she is still, in essence, the Female Buddha. While Tara might save a man drowning in the river, Vajrayogini is seen as a saviour in a different way. This complex thangka depicts the various lineage masters going all the way back to Buddha Vajradhara, who is actually Buddha Shakyamuni is tantric form. At the upper left are the main tantric deities – Yamantaka, Heruka Chakrasamvara and Guhyasamaja. At the upper right are the Buddhas of the past and present – Krakucchanda, Kasyapa and Shakyamuni. At the bottom left are the three long-life deities – Amitayus, Namgyalma and White Tara. At the bottom right are Chenrezig, Manjushri and Vajrapani, who, taken together can be said to represent Lama Tsongkhapa, the great 14th century Tibetan scholar and saint who is an emanation of these three great Buddhas. Below Vajrayogini are two Dharma Protectors – 4-faced Mahakala (a wrathful emanation of Heruka) and Citipati, the special Protector for Vajrayogini practitioners. For example, there is the story of the novice monk Kusali who saw a leper woman unable to cross the Ganges river. All the other monks ignored the sick woman, afraid of contagion, but he had compassion and carried her on his back across the river. Half way accross the river, he suddenly found himself bodily dangling in the air, rising above the river. In fact, the leper woman had been Vajrayogini, and by showing compassion, She took him immediately to her Pure Land, Kechara. There are numerous stories of Vajrayogini coming to her followers, and immediately taking them to her pure land. The ultimate goal of Enlightenment remains the same in all practices, Tara, Vajrayogini and others. However, the yogi or yogini who practices Vajrayogini intensely focuses on the goal of Enlightenment through the introduction of bliss to help us embrace Emptiness without nihilism. The post Tara, the Saviour, and Vajrayogini the Sarvabuddhadakini: how are they different, and how are they the one? The importance of Female Buddhas: Wisdom personified appeared first on Buddha Weekly: Buddhist Practices, Mindfulness, Meditation. They remain a vital and living spiritual legacy from the great Padmasambhava, the Lotus Born. Perhaps the best known of the Seven Supplications is “The Supplication for the Spontaneous Fulfillment of Wishes, a text that was revealed by treasure revealer Tulku Zongpo Drakpa, and translated by Rikzin Godem Chen (1337-1408) into Tibetan. It is said that faithful supplication of Guru Rinpoche with this supplication can bring the fulfilment of wishes. Beside the range of snow mountains. To whom can my family turn!? Wars and battles: the nation’s life. Hills and dales are with bandits rife. E Ma Ho! In the western Blissful Pure Land, Buddha Infinite Light’s compassionate blessing stirred To bless manifest enlightenment, Lotus Born, Who came to this world to aid the beings of Tibet Compassionate one, who unceasingly aids the world, Master Lotus-Born, please bless me — Grant my wish spontaneously From King Trisong Detsen Until the end of the royal lineage of Buddhist kings, You bless each ruler continuously, Sole friend of Tibet’s religious kings. Compassionate one who lovingly protects spiritual sovereigns, Master Lotus-Born, please bless me- Grant Grant my wish spontaneously. Your body subdues cannibal spirits in the southwest While your compassion turns toward Tibet. Glorious leader of sentient beings lost in ignorance, You skillfully guide beings with deep-rooted emotions. Compassionate one whose loving affection never ceases, Master Lotus-Born, please bless me-Grant Grant my wish spontaneously. In evil times, when degeneration reaches its depths, You will come to Tibet at dawn and dusk, Riding the sunlight’s brilliant rays. On the tenth days of the waxing and waning moons you’ll visibly appear. Compassionate one who works forcefully for others’ benefit, Master Lotus-Born, please bless me- Grant my wish spontaneously. In the degenerate time of conflict, the final five hundred years, All sentient beings’ five poisonous emotions will coarsen. When those poisons churn within me, Be loving toward me, Guru! Compassionate one, who leads the faithful to higher realms, Master Lotus-Born, please bless me Grant my wish spontaneously. When I am surrounded by hordes Ready to destroy Buddhist insitutions, To you I pray with no doubt or hesitation: Master from Oddiyana, circled by gods and demons’ eight groups, You’ll turn back the ruthless armies Master Lotus Born, please bless me — Grant my wish spontaneously. When disease strikes sentient beings’ illusory form, Bringing overwhelming intense pain, To you I pray with no doubt or hesitation: Inseparable from the Medicine Buddha of Oddiyana, You’ll surely dispel these obstacles and ensure that my life does not end. Master Lotus-Born, please bless me — Grant my wish spontaneously. When the elements rise as enemies and the earth is polluted, Bringing danger of sickness and famine, To you I pray with no doubt or hesitation: Divine Wealth God of Oddiyana with your assembly, You’ll surely dispel hunger, thirst, and poverty. Master Lotus-Born, please bless me — Grant my wish spontaneously. When destined persons reveal treasures for beings’ benefit, Armed with the fierce confidence of having kept their commitments guilelessly, To you I pray with no doubt or hesitation: Master from Oddiyana, inseparable from the deity, Your children will surely retrieve their father’s wealth. Master Lotus-Born, please bless me — Grant my wish spontaneously. When I wander in hidden, densely forested, isolated regions And raging blizzards block my way, To you I pray with no doubt or hesitation: Master from Oddiyana with your circle of powerful local deities, You’ll surely guide practitioners on the path Master Lotus-Born, please bless me — Grand my wish spontaneously. When I encounter wild animals, such as tigers, leopards, bears, or poisonous snakes, In the fearful wilderness on open plains, To you I pray with no doubt or hesitation: Master from Oddiyana with ging warriors and guardians, You’ll surely chase savage beasts away. Master Lotus-Born, please bless me — Grant my wish spontaneously. When obstacles of the elements — earth, water, fire, or wind — Threaten to destroy this illusory body of mine, To you I pray with no doubt or hesitation: Master from Oddiyana, with the four elements’ gods, You’ll surely calm the elements within themselves. Master Lotus-Born, please bless me — Grant my wish spontaneously. When I walk along a narrow, fearful passage And murderous thieves and bandits threaten me, To you I pray with no doubt or hesitation: Master from Oddiyana, skilled in the four gestures, You’ll surely destroy those savage men’s greed. Master Lotus-Born, please bless me — Grant my wish spontaneously. When I am surrounded by killers Who will strike me with sharp weapons, To you I pray with no doubt or hesitation: Master from Oddiyana with a vajra tent, You’ll surely make the killers drop their weapons and flee. Master Lotus-Born, please bless me — Grant my wish spontaneously. When my life ends and death arrives, And the intense suffering of my extinction torments me, To you I pray with no doubt or hesitation: Master from Oddiyana, emanation of Buddha Infinite Light, You’ll surely lead me to Blissful Pure Land. Master Lotus-Born, please bless me — Grant my wish spontaneously. Once this borrowed illusory body has died And I suffer from delusionary appearances after death, To you I pray with no doubt or hesitation: Master from Oddiyana, compassionate knower of the three times, You’ll surely free delusion within itself. Master Lotus-Born, please bless me — Grant my wish spontaneously. At any time, when karma or conditions Lead me to suffer from overt attachment to delusionary appearances, To you I pray with no doubt or hesitation: Master from Oddiyana, essence of the king of great bliss, You’ll uproot my suffering caused by delusion. Master Lotus-Born, please bless me — Grant my wish spontaneously. When suffering overwhelms the six realms’ beings And, in particular, when Tibet’s ruler and people suffer, To you I pray with no doubt or hesitation: When I pray with intense faith, respect, and devotion, Master from Oddiyana, continually watch over me with compassion. Master Lotus-Born, please bless me — Grant my wish spontaneously. Master from Oddiyana, your disciples who wish to leave the wheel of life Turn to you with single-minded devotion; Like children calling their parents with heartfelt songs, We pray to you during the six times of the day and night. Master Lotus-Born, please bless me — Grant my wish spontaneously. Ngawang Zangpo. Guru Rinpoche: His Life and Times (p. 216). Kindle Edition. The post Seventh Supplication of Guru Rinpoche: “Repeat this prayer continuously” for the granting of wishes appeared first on Buddha Weekly: Buddhist Practices, Mindfulness, Meditation. Not all Buddhists are vegetarians. Did the Buddha actually suggest a vegan lifestyle? And, putting aside Buddhists, why is the meat industry growing when the science says it’s hurting our planet? These are the questions that frame our special feature focusing on Vegetarianism: five ways it could save the world, five Buddhist teachings that recommended veganism, and five reasons it’s just the ethical thing to do. And, since not everyone reading this feature is a Buddhist, let’s start with the science. According to most scientists, animals are sentient and feel emotions. Contrast this happy pig to the unhappy pigs on a factory farm below. inability to feed our population: perhaps more urgent than the environment is our inability to currently feed the world’s population, in part due to the unbalanced allocation of land: meat production uses 23 times as much land as crop production. overuse of important resources such as water — and pollution of water. Reduction in demand for meat by any sizeable percentage, would ease many of the issues and pressures identified by experts. Demand for meat around the world is growing, with over 56 billion animals slaughtered each year, increasingly from factory farms who are major polluters. If we’re serious about global warming and the environment, even modest reductions in dependence on meat will have a higher impact on the environment than things such as emissions controls on automobiles. That restaurant steak on the plate could represent 9,000 liters of water, 40 kilograms of poop (waste), 4 kilograms of feed and more emissions pollution than a car might create on an hour-long drive to the restaurant. His Holiness the Gwalwang Karmapa is a vegetarian and recommends the lifestyle to Mahayana Buddhists. “We say I am going to do everything I can to free sentient beings from suffering. We say I am going to do this. We make the commitment. We take the vow. Once we have taken this vow, if then, without thinking anything about it, we just go ahead and eat meat, then that is not okay. It is something that we need to think about very carefully.” The Dalai Lama also strongly recommends vegetarianism. According to scientific consensus, animals are sentient and feel emotions. This duck is a little happier than the birds in the chicken factory farm depicted below. But, before examining the ethics and Buddhist perspective, let’s start with five ways meat is damaging the environment and our world. Meat consumption is growing in developing nations. There won’t be enough land to support the growth. It is estimated 45% of non-ice land in the world will be used for meat production within a few years. The meat industry is one of the largest emissions contributors, producing more emissions than all the automobiles and planes put together. This issue will only be exacerbated by the expected growth of our population 4 billion. As a practical consideration, putting aside environment, ethics and all, there is not enough land to produce that much meat. It’s worth remembering that developing nations are quickly becoming advanced nations, increasing demand for meat. Factory pig farm producing waste products. Unlike organic farms, large scale factory farms product more pollution than a small human city. The meat industry is currently the largest methane producer, and the biggest contributor to pollution and global warming. World Bank Scientists pegged the number at much higher, because they include extra considerations like clear-cutting oxygen producing forests to favor animal agriculture, fertilizers and many other factors, such as transport, bringing the total up to 51%. In other words, if only 25% of the world’s population converted to vegetarianism, the impact on the environment would be staggering. That’s a fact, not even arguable (although certainly some will try. Which brings us to fact Two — the population is increasing. Increasing wildfires and turbulent weather are two of the consequences of global warming. Fact Two — It takes 23X as much land to grow our vegetables as to raise meat livestock — not enough land to feed the expected increase in world populations. In other words, when the population grows by only 3 billion, we’ll need to consume another 15% — assuming demand per person doesn’t increase as nations grow richer—and we’ll have another 500 million starving humans. For livestock, 45% of land in the world — and unlikely possibility, even if we clear cut the few remaining forests (which leads us to the third fact — deforestation). Not all land is suitable for livestock. Of course, speaking facetiously, if the polar icecaps keep melting we may have more land for meat. Factory farming requires extensive land, water and natural resources. Put another way, in the US. alone, 13m hectares of land are used to grow vegetables, while it takes nearly 23 times that much, 302m hectares for livestock. “The problem is that farm animals are inefficient converters of food to flesh,” writes the Guardian. For example, pigs need 8.4kg of feed to produce one kilogram of meat. Agriculture in general is causing deforestation, mostly for meat and a few crops such as palm oil and soya. Write the Guardian: “Millions of hectares of trees have been felled to provide burgers for the US and more recently animal feed for farms for Europe, China and Japan.” 6m hectares of forest land a year are lost (roughly twice the size of Belgium) with most converted to farmland. Putting aside the destruction of animal habitat there’s an enormous climate cost. The second largest crop to go on that clear-cut land is soybeans, mostly grown to feed the cattle. Clear cutting is necessary to create more land for meat production. Currently, 36% of non-ice land in the world is used in meat production, expected to grow to 45%. Using arable land for crops versus meat production could have more impact on global warming than emission controls on factories and cars. The article goes on to present shocking pollution statistics, such as “most summers between 13,000 and 20,000 sq km of the sea at the mouth of the Mississippi becomes a “dead zone”, caused when vast quantities of excess nutrients from animal waste, factory farms, sewage, nitrogen compounds and fertilizer are swept down the might river.” There are nearly 400 dead zones that have been identified, largely due to animal farming. It may not be a top of mind issue in North America, where water is somewhat plentiful, if polluted. But in most other parts of the world, water shortage and clean water is a serious, even life-threatening issue. It requires approximately 9,000 litres of water (20,000 pounds) to produce one pound of beef, 1,000 litres to produce one litre of milk. A broiler chicken “only” consumes 1,500 litres. Pigs are the worst, with the largest pig farms consuming as much water as a normal-sized human city. Indicated on map are areas of the world with not enough water for survival. Meat production uses a disproportionate amount of precious water resources and contributes to the pollution of remaining water. There is no doubt that farming consumes the majority of our water, 70% according to expert estimations, but this number could be dramatically reduced if we transitioned more food output to crops versus meat. Cows feel emotions, according to the majority of scientists. A glance at this happy cow reinforces this fact. Bottom Line — Meat a higher negative impact on the environment as compared to other major industries. If we put aside ethical and Buddhist arguments, the meat industry is harmful to our collective help. Even a modest decrease in demand for meat can result in positive environmental returns. Significant decreases in demand could, literally, save our planet. Science not only proves horrendous impact of the meat industry on climate change and our environment, it asserts rather forcefully that even fairly simple non-human animals and birds — including fish — are sentient and have emotions. Both positions might be debatable, but these facts are credibly established. Which returns us to ethics and Buddhist teachings, since helping sentient beings is one of the most important compassion foundations of Mahayana Buddhism. To subdue this “I can’t” mind, many Buddhists — and non-Buddhists — practice mindfulness to still the mind. In Buddhist practice, this stilling of the “monkey mind” has many advantages, and can help us glimpse reality as it truly is — the wisdom path to eventual enlightenment. Then, to activate the “impossible” mind, Buddhists — and non-Buddhists — practice forms of visualization. Deity visualization in Vajrayana Buddhism is a powerful practice that imagines “ourselves as we would like to be, as an enlightened being, and this enables us to actualize that state much more quickly,” according to Geshe Tashi Tsering in his book Tantra: The Foundation of Buddhist Thought. Non-Buddhists also often enhance their life with personal visualizations — everything from daydreaming, to positive affirmations, to guided meditations. It’s the same principle in Vajrayana, except with Enlightened Beings as the object of visualization — and the mantra (and what that represents) as the positive affirmation. Mindfulness mediation can be seated and formal, or casual as you work through the day. There is a feeling of peace, and being in the “present moment” with mindfulness. The stillness can allow us glimpses of our own Buddha Nature. From a Buddhist point of view — neither. Mindfulness, or stilling the mind by bringing us intimately into the present moment, has an immediate advantage of simplicity in today’s busy world. It’s also easily understood, can be self-managed, and requires no major training. 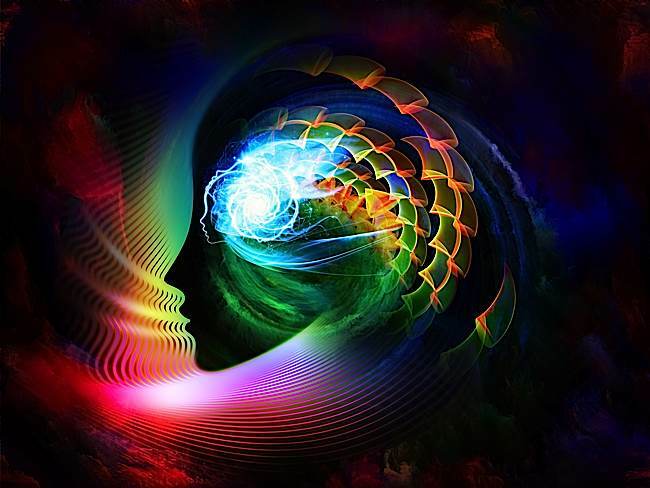 Visualization practice pursues the same goal with the opposing tactic: activation, rather than pacification, of the mind—using every sense in the body and every available neuron in the brain. Both styles of meditation have their own set of advantages and disadvantages. There are also separate “health” and living benefits, not related to practice goals. At a high level, one of the goals of both styles of meditation, in Buddhist practice is to glimpse reality — and realize the wisdom of emptiness. More importantly, according to many teachers, mindfulness allows us to still our mind enough to glimpse our very own Buddha Nature—inherent to all sentient beings. Mindfulness underpins Vipassana meditation methods—seeing things as they are. Deity visualization supports tantric methods — seeing beyond the ordinary. Living the Six Perfections: generosity, patience, morality, joyous perseverance, concentration and wisdom. One goal of mindfulness is to glimpse the Buddha Within and ultimately to develop the Wisdom of Emptiness. Vajrayana visualizations pursue the same goal by actively experiencing the Buddha Nature—at first through imagination. Purity of Activities: guided visualization on benefiting sentient beings. No focus Focus: Deity, or idealized Enlightened being. Vajrayana visualization practice opens the mind in an active way. Vajayana and tantric Buddhists tend to practice both mindfulness and active visualization practices. Advanced practitioners may practice only deity practices, but these advanced sadhanas combine the best of both. A popular visualization of Amitabha, with symbolic attributes, such as body of red in the nature of light, begging bowl and lotus flowers. Amibtabha is the head of the “Lotus” family, the compassion of the Buddhas. The exotic nature of visualizing deities also shifts our mind, helping us move conceptually away from “ordinary” thinking. Deities in Buddhism are not Gods as thought of in theistic religions. Deities are a complicated topic, but from a strictly psychological point of view they tap into universal archetypes. “Each deity in Tibetan Vajrayana is an iconic representation of a particular enlightened energy within us that we are trying to actualize,” writes Geshe Tsering. The very power of visualization is working with images (as well as sounds, smells, touch and other senses). 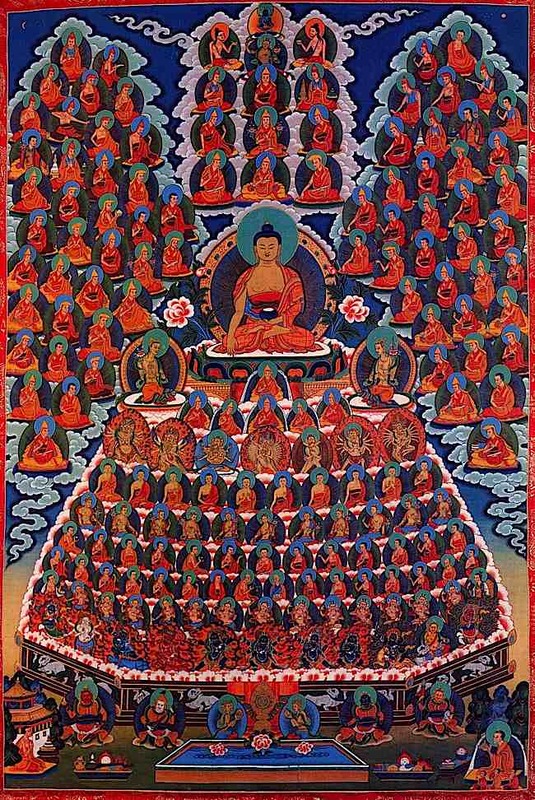 For example, the image of compassion is Chenrezig (Avalokitesvara), is often visualized with 1000 arms, each arm reaching out to help sentient beings, symbolically expressing His extraordinary caring. Green Tara is visualized as green (symbolizing wind or activity), and she is seen with one leg outstretched — the hero leaping up to help those in need, in Her lovely capacity as a savior. Since visualizing requires an object of refuge to visualize, deities are reinforcement for our meditation. We tap into an particular aspect of the Buddha Within—for example Manjusri for “wisdom” or Avalokitesvara for “compassion.” The power of sadhanas stems not only from the combination of wisdom and compassion, but also from the use of all the senses to reinforce the “beyond ordinary” experience. activity: for example, visualizing purifying light blessing all sentient beings, and other activities. All of this reinforces the visual symbolism of the deity. Sometimes, even the actual physical (or visualized) location is heavy with symbolism and reinforces our meditational goals. For example, advanced Chod practice is often conducted in a Cemetery, at night. From a less spiritual point of view, mindfulness is well accepted in the psychiatric community as a method for reducing stress, and improving health issues that are impacted by stress — arguably all major health issues. A 2011 study in Neuroimage, broadly maps out how mindfulness changes the brain for the better. On the other hand, Vajrayana Deity visualization practices improve cognitive performance and have a promising impact on patients with degenerate brain disorders, according to a study from the National University of Singapore. What’s the main difference between non-Buddhist and Buddhist perspectives on the two methods? The goals, clearly. Buddhist practitioners will have taken refuge prior to any meditation, while non-Buddhists likely wouldn’t. As Buddhists, the ultimate goal is nothing less than touching the Buddha within and achieving Enlightenment. Non-Buddhists will be content with either heightened relaxation and stress relief—with mindfulness methods; or, improved cognitive function, conceptual thinking and planning with active guided visualizations. Which is better? Neither. Both are powerful, and most people can benefit from using both styles of meditation. 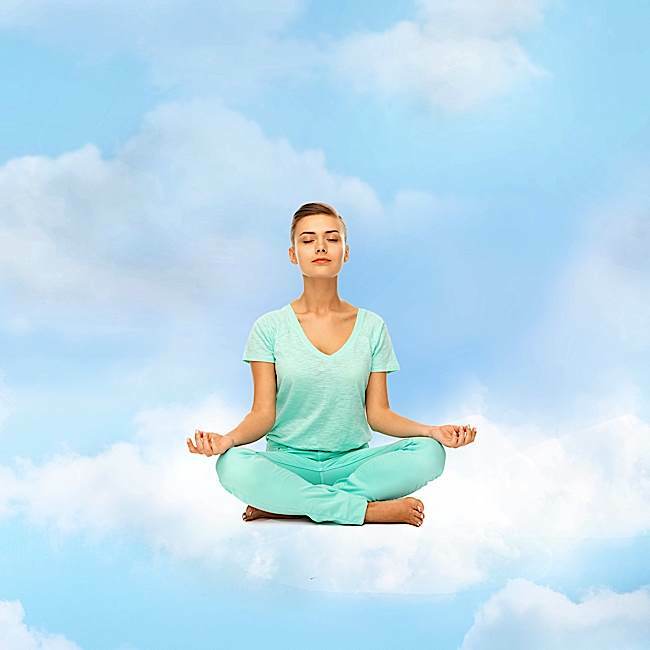 Mindfulness meditation pacifies, creating space for wisdom—and reducing stress. Visualization, on the other hand, activates mind on the heroic quest for the Buddha Within—and improves cognitive function. Contrary to the notion that they might be opposites—pacification versus activation—they are complimentary. Tantra: The Foundation of Buddhist Thought, Volume 6, Geshe Tashi Tsering foreword by Lama Zopa Rinpoche. The post Visualization Activates the Mind; Mindfulness Stills the Mind — Which is Right for Your Buddhist Practice? appeared first on Buddha Weekly: Buddhist Practices, Mindfulness, Meditation. May all sentient beings have happiness and the causes of happiness; May all sentient beings be free from suffering and the causes of suffering; May all sentient beings never be separated from the happiness that knows no suffering; May all sentient beings live in equanimity, free from attachment and aversion. Visualization is more formal, usually a part of advanced Buddhist practices, where they might be guided. Truly advanced visualizations include Vajrayana Buddhist meditations where you place all of your enemies in front of you and your friends/family.. The post The effects of stress on your body: how meditation and 8 other lifestyle changes can help you stay healthy appeared first on Buddha Weekly: Buddhist Practices, Mindfulness, Meditation. The term Spiritual Warrior (Tibetan “sems dpa”) may hint at more than a whiff of bravado and violence — until it is understood that the enemy of the Spiritual Warrior is “avidya” or self-ignorance. Overcoming avidya is at the root of Buddha’s teachings, and so is the conduct of the warrior spirit inherent in the term. Buddhism — while pacificist in nature — is full of military terms — not because Dharma is violent, but because, “warrior” is a metaphor best understood by human beings. In Mahayana Buddhism, where compassion is the equal of wisdom, the concept is taken to the next level, where the warrior is also the hero rescuing others — the Bodhisattva. Then, there’s is the greatest “super hero” of all time: Green Tara; or the great Yogi hero Milarepa, who faced countless demons. Fearlessness is a necessary trait of successful Buddhist practice. Buddha on his famous beloved horse Kanthaka with his attendant Chandra behind. Shortly after this scene, the brave prince renounces worldly riches and power, cuts his hair, and becomes a poor medicant searching for Enlightenment. Horses, chariorts, bows and arrows are common terms in Sutra, often used as metaphors. In explaining why he remained unresponsive to the four questions, Buddha used the parable of the poisoned arrow. Conqueror — in Sanskrit Tathagata — is synonymous with Buddha: the victorious conqueror over samsara. Daka and Dakini — translates as “Hero” and “Heroine,” the champions of the Enlightened Sangha in Tibetan Buddhism. Protectors and Guardians — often symbolically armed with many weapons: spears, flaming swords, lassos — each carrying profound meaning. Shaolin martial arts — in legend Bodhidharma, the great Buddhist saint, reputedly taught the monks the skills of self-defence. King Virudhaka declared war against the Buddha’s clan, the Shakyas, and marched against them. The Buddha stood in his way three times. Each time King Virudhaka dismounted, paid his respects, remounted and retreated, but he kept coming back every day. Giving up victory and defeat. The great Milarepa, the fearless Yogi. Lord Gizo courageously descends to hell on a lotus throne to help those suffering in hells. He is beloved all over Asia as the protector of children. He also taught “demons” in his compassion, transforming them with the Dharma. The Demons tried everything to intimidate Milarepa, with huge boulders flying through the air, rivers diverted from their riverbeds to swamp him. Milarepa subdued the flood with a simple gesture. Whether you view the dangers as internal, or external, it takes courage to practice as a Yogi. Many other religions use military language, of course. In The hymn “Onward Christian soldiers” comes to mind. But, in Buddhism, the metaphor of soldier and warrior is pervasive, right from the original teachings of the Buddha, through to the Vinaya code of conduct, through to the various forms of Buddhism, and especially in Tibetan Buddhism and Shaolin Mahayana Buddhism. The military-like code of conduct, the Vinaya, evokes the proper discipline and tone of the original monks and nuns of Buddha’s Sangha, as described in the Agganna Sutta. In monasteries, a high ranking monk is normally the “disciplinarian.” For lay practitioners, we had only five core moral precepts — not to kill, steal, lie, become drunk or high, or abuse sense-pleasures (to use modern language). But, in personal practice, we are our own disciplinarians. Refraining from killing remains a key precept. But the activities of the Buddhist practitioner, working with the “demons” and internal obstacles of craving, doubt and anger, remains a warrior-like mission. Even in simple breathing meditation, military-like discipline is needed. Missed a meditation session? Impose a hundred metaphorical laps around the stupa as a self-imposed discipline. Craving a new luxury car? Sit, and meditate on the attachment — and how that money could benefit so many others. Lied to a friend? Come clean, then promise not to do it again. In moral conduct, an even more rigorous “military” code — the precepts of the Buddha — makes sure the spiritual “soldier” focuses on compassion and wisdom, and ultimately, Enlightenment. There are two key differences between the spiritual warrior and the actual weapon-brandishing warrior: spiritual warriors fight obstacles and delusions, and do not kill sentient beings; and the discipline is self-imposed. You are the hero, general, and soldier. You answer only to the Three Jewels: Buddha, Dharma and the Enlightened Sangha. The Enlightened Sangha of spiritual heroes is our example. Modern day statue of Bodhidharma. Bodhidharma, according to tradition, brought martial arts to the monks to help with discipline, health and self-defence. Euthanasia issues, to eliminate one kind of suffering for the terminally ill pet, for example, is against the precept of killing — but often we take on that negative karma for the sake of our beloved, suffering pet. Killing in self-defence — a similar situation to the working soldier with a gun who is defending the innocent from harm. In other words, like real soldiers, the Buddhist must make daily decisions with repercussions. The real soldier relies on the chain-of-command to justify actions. The Buddhist spiritual warrior relies on Buddha, Dharma and Sangha — and ultimately, the self. Prince Siddartha, later to become the Buddha, grew up in the palace and was an expert in martial arts. When Shakyamuni Buddha cut his hair, he symbolically separated himself from the worldly, including his past role as a princely member of the “warrior caste.” The Shakya clan — to which he was the heir — was a warrior caste governed state, at a time when the warrior caste and the brahminic caste were rivals for leadership. He was an expert He put aside all of that, and instead marched to war against Mara and his demons. You can view Mara as a literal devil-like being, or as our own mind’s temptations born of our cravings and self-ignorance (Sanskrit: avidya.) Either way, when Buddha determined to release the world from the suffering of Samsara, his mission became a mental crusade. In the final “battle” he sat beneath the Bodhi Tree, fighting with Mara and his demons and daughters (temptations) until he attained final, and complete victory. The river metaphor appears often in Sutra teachings. Here, Shakyamuni is assailed by Mara, but the evil ones are swept away in the river of Samsara. Buddha, the Enlightened, is unassailable. Keeps his mind unshaken, like Mount Meru. Like a dream, and like clouds. He meditates steadfastly, established in the Dharma. Since they are in the clutches of ignorance. That all phenomena arise in dependence and lack reality. Unperturbed by the spectacle of the army of rogues. And the joy of liberating sentient beings and the happiness of a loving mind. Dust and soot rain from the sky. The post Sems dpa, the Buddhist Spiritual Warrior, the Hero, the fearless Buddhist: overcoming self-ignorance and our maras appeared first on Buddha Weekly: Buddhist Practices, Mindfulness, Meditation.